Anthropology – is the study of human beings. It has origins in the humanities, the natural sciences, and the social sciences. The term “anthropology” is from the Greek anthropos, “human being”, and -logia, “discourse” or “study”, and was first used in 1501 by German philosopher Magnus Hundt. Antonio Pigaffetta – an Italian scholar and traveller from the Republic of Venice. -Lack of training as anthropologists. -Tendency to view terms for their missionary presence. -Inability to evaluate an Asian society, re enforced by their conviction of racial superiority. 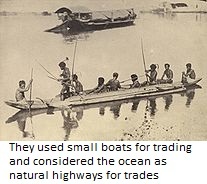 The Filipinos before the arrival of the Spaniards were basically hunters, fishers, and cultivators. These tribes were groups of highlanders who barely had access of seawater. And because of the presence of rice terraces, only the central mountains of Luzon had well-structured livelihood that resulted to a more fixed territory. Baranganic society had a distinguishing feature: the absence of private property in land. There were four classes of society. They were the ruling class (datu), the freemen and notable persons (maharlikas), the commoners (timawa), and the dependents and slaves (alipin). 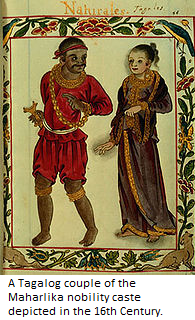 The alipin were of two kinds: the aliping namamahay, who were household servants, and the aliping saguiguilid, who were slave workers. Sometime in the 13th century, Islam was introduced to the archipelago in Maguindanao. The Sultanate of Sulu was established and claimed jurisdiction over territorial areas represented today by Tawi-tawi, Sulu, Palawan, Basilan and Zamboanga. The Muslim societies evolved an Asiatic form of feudalism where land was still held in common but was private in use. The natives already wore clothes and personal ornaments. The men wore short-sleeved and collarless jackets, whose length reached slightly below the waist. The color of the jacket appeared to indicate the position of the wearer in society, red for the chief, and blue for those below him, depending on the societal class. For the lower part, they wore a bahag, a strip of cloth wrapped around the waist, passing between the thighs. Their thighs and legs were left exposed. A piece of cloth wrapped around the head, called a putong, served as a head gear. The kind of putong one wore was important. For example, a red putong meant the wearer had killed a man in war while one who had killed at least seven people signified so by wearing an embroidered putong. They also wore necklaces, armlets or kalambiga, earrings, rings and anklets, usually made of gold and precious stones. The women’s upper garment was a sleeved jacket, called a baro. Over their skirts (saya or patadyong) was wrapped a strip of cloth called tapis. They also wore gem-studded bracelets, necklaces, rings, and gold earrings. Tattoos were part of the body ornaments of pre-Hispanic Filipinos, men and women alike. These were also sported as war “medals.” The more tattoos, the more impressive was a man’s war record. The Filipinos from the Visayas islands were the most tattooed, which was why early Spanish writers referred to them as Pintados or painted people. Early Filipino ancestors valued education very much. 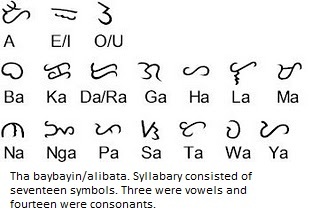 Filipino men and women know how to read and write using their own native alphabet called alibata. The alibata was composed of 17 symbols representing the letters of the alphabet. Among these seventeen symbols were three vowels and fourteen consonants. Barangay– derived from an ancient Malayo-Polynesian boat called Balangay. Each Barangay were kinship units and was different and ruled by a chieftain called Datu. The Datu had a wide power for he exercised all the functions of govt. He was the Executive, Legislative, and Judge and was the supreme commander in the time of war. Economy during the pre-colonial times was subsistent. Communalism– The practice of communal living and common ownership. The Filipinos before the arrival of the Spaniards were basically hunters, fishers and cultivators. Rice-The main article of food. They grew an abundance of rice, sugarcane, cotton, hemp, coconuts, bananas, and many other fruits and vegetables. Land cultivation was by tilling of or by the Kaingin System. Bathala– Tagalog Supreme diety, and his children Adlaw, Mayari, and Tala.